When undertaking a major project such as Kitchen remodeling in Walnut CA, it’s really important to have the right contractor on the job. At Cabinet Magic, we believe we are that right contractor. Cabinet Magic is a licensed contractor with the skills and experience required to guide remodeling projects of any size or complexity to completion. We seriously care about client satisfaction and we will work hard to make sure you love your new kitchen. 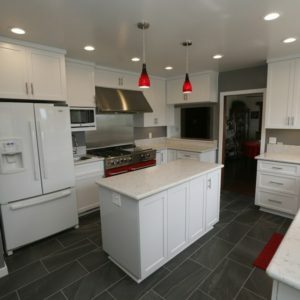 Kitchen remodeling in Walnut CA can range from simply updating the room with new cabinets, fixtures, and accessories to totally redesigning the floor plan. In either case, you may be concerned about how the finished project will turn out. After all, samples can look quite different in your hand than installed in your kitchen. At Cabinet Magic, we understand how important having an accurate visualization of the finished kitchen remodeling in Walnut CA is for your comfort and peace of mind. That’s why we utilize 3D computer rendering to help clients design their new kitchens. We’re happy to create multiple versions of the design so you can easily compare different options. We never begin work without your sign off and approval of every detail of the design. In most kitchens, cabinetry is a major feature and must be considered carefully as a design element. Cabinet Magic has been creating stunning custom cabinets right here in California for nearly 30 years, and we can make your design vision a reality. We offer a complete range of styles from modern to traditional, along with virtually any color of paint or stain you could want. We even offer custom crown molding for cabinets. We maintain strict quality standards so you can rest assured your new cabinets will fit your space perfectly and stand the test of time. If you are interested in working with Cabinet Magic for your kitchen remodeling in Walnut CA, please give us a call at 800-828-4380 so we can set up a free in home consultation with one of our knowledgeable team members. You’ll have an opportunity to bounce design ideas off of us and then receive a free estimate for your remodel.